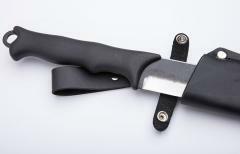 A proper leather scabbard for the Skrama bush knife! Tough and beautiful in its functionality, like the Skrama itself the sheath too is designed to be purely practical - it has all you need and no more. 6 cm wide belt loop, fits just about any belt you can find, even those extra wide military types. 2.4" wide belt loop, fits just about any belt you can find, even those extra wide military types. D-ring swivelled belt loop lets the knife turn on your belt keeping it from coming in the way when moving about or sitting. Snug fitting press stud strap secured the knife properly in its place. When brand new the strap may seem "short", just pull on it a bit or wet it with warm water and it will soon get a perfect length and shape! And last but not least the sheath does of course have a drainage hole at the very end. Inside the leather sits the same plastic blade guard that comes with the standard Skrama. High quality materials: the leather is 2mm thick vegetable tanned cowhide, strong and sturdy. All attachments are made with numerous strong studs. High quality materials: the leather is 0.08" thick vegetable tanned cowhide, strong and sturdy. All attachments are made with numerous strong studs. - ei hinnan kiroissa, nahka maksaa, joten ellet halua uniikkia itse väsätä, ota tämä! It's a great sheath. The only disappointing thing for me was that it's made of bonded leather. + Skrama pysyy hyvin tupessaan ja kahvan ympäri menevä neppariremmi pysyy kiinni. - Vyölenkki D lenkin kanssa vähän jäykkä kääntyäkseen vyöllä. 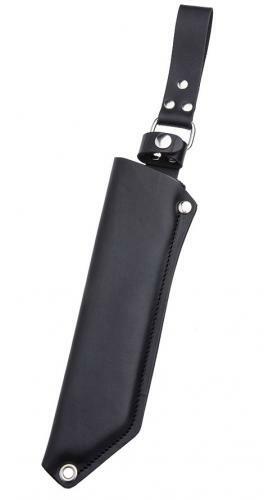 Lovely sheath, good build quality. Leather was a tad dry for me but nothing a minute with some grease and a cloth couldn't remedy.